Started in 1996, SunRidge Canyon Real Estate is a 789-unit master-planned community located on the eastern edge of the McDowell Mountains in beautiful Fountain Hills, Arizona. The community features 15 separate neighborhoods of single-family homes, built around the highly-ranked SunRidge Canyon Golf Course, which wends its way through the community. Sunridge Canyon Real Estate is a Master Planned Golf Community. It is one of the premier golf courses in Fountain Hills. The real estate and homes that are Sunridge Canyon are high quality luxury properties. Sunridge Real Estate has something for everybody. Prices range from $300k to well into the millions. Sunridge Canyon Real Estate is described as an upscale community with hometown character, Fountain Hills offers some of the most desirable real estate opportunities in Fountain Hills, Arizona today. Known for its spectacular mountain and desert views, SunRidge Canyon Real Estate remains one of Fountain Hills’ more accessible communities. Just minutes from Scottsdale and the 101 freeway, it is located north of Shea Boulevard, off Palisades Boulevard. Fountain Hills schools are nearby. Neighborhoods at SunRidge Canyon Real Estate, two of which are gated, fit many lifestyles. In addition to neighborhoods by some of Phoenix’s finest builders, there are also an array of custom homes and many undeveloped lots still available. Despite that fact that Fountain Hills real estate is home to many upscale Arizona golf communities like Sunridge Canyon Real Estate , it has been able to maintain that quaint hometown feel. The main reason the community has been able to achieve this is due to the natural boundaries that surround Fountain Hills preventing massive expansion. 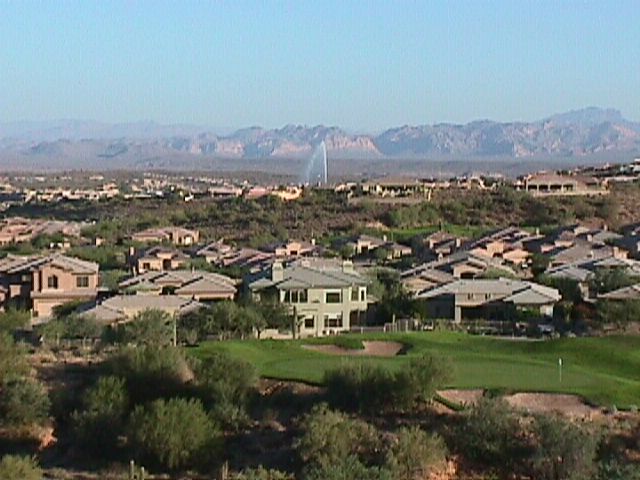 Fountain Hills has limited ability to build more housing or golf courses. Hidden among the ridges and canyons of the foothills of the McDowell Mountains, widely considered one of the most picturesque and dramatic stretches of natural land left in the Scottsdale area. The beauty and challenge of this golf experience has made SunRidge Canyon one of the most highly rated clubs in Fountain Hills, Arizona. This scenic desert links-style course features numerous elevation changes in a canyon setting. Accuracy is foremost on this course's rolling fairways surrounded by desert. Strategically placed arroyos provide a good test of golfer's shotmaking skills from the tees, as well as approaching the greens. The greens are medium-sized and undulating. Water hazards, in the form of ponds, come into play on four holes. The signature hole is #17, a 209-yard, par 3, featuring a segmented green that is guarded by large boulders on both sides. "GOLF Magazine" rated this course 42nd best under the 1996 category of the "Top 100 Courses You Can Play in the U.S." The 6,004-yard men's tee also has a ladies' course rating of 75.2 and a slope of 141. From beginning to its incredible finish, SunRidge can compete with any course in the area (and far beyond) for its stunning panoramic views and pure measurement of your mental game and shot-making skills. The front nine begins at the upper mouth of the canyon and plays downhill in switch back fashion to the canyon floor. Along the way, each shot demands careful consideration and must be weighed on its risk/reward factors. Because the fairways are not parallel with each other, players enjoy a true sense of serenity. However, don't let this tranquil desert setting fool you. This course's rare beauty tests every aspect of your game. Sunridge Golf Course and the Real Estate that is there is a valuable asset to Fountain Hills. Sunridge Canyon Real Estate / Homes and the Golf Community are well worth taking a look at, if you're looking for a luxury golf community in Fountain Hills. The beauty and luxury of this Fountain Hills /Scottsdale Golf Community make the drive to Sunridge Canyon worth it. At Sunridge Canyon there's a Luxury Home for sale or being built for the most discerning buyer. Let Bill Slack help you find the perfect Sunridge Canyon Home for sale in beautiful and quiet Fountain Hills. Adjacent to Sunridge Canyon Golf Club is Desert Canyon Golf Club, located close to downtown Fountain Hills, and the world famous fountain that Fountain Hills gets in name. When you decide to buy Fountain Hills AZ Real Estate, (whether it's Sunridge Canyon Real Estate or some other premium Scottsdale-Fountain Hills AZ Real estate) be prepared to live amidst some of the most renowned luxury resorts and spas, championship golf courses, gorgeous homes, and natural desert beauty in the world. With all these amenities at your fingertips you’ll be living in paradise.